If you don’t yet know what a Twitter follower is, you will soon find out. It seems everywhere you turn today, Twitter and tweeting are the new buzz words. Twitter, a social network that has only been around for ahile, has tremendous popularity worldwide. Everyone seems to be excited about this up and coming way to communicate with others. Twitter is a social network, where participants can send and receive short messages from other Twitter members. Unlike other social networks like Facebook and My Space, Twitter is designed so that it can only be used as a SMS or a short message service. Every message that you send is limited to 140 characters per post. While Twitter is commonly used by individuals to stay in close contact with friends and family members, it is more and more often being used by companies and organizations as a way to market products and services. Companies like Dell and Jet Blue use Twitter to market their services and even Barac Obama and John Edwards used Twitter as a marketing means while on the campaign trail. Now you might be wondering how exactly does this all work? How do you get people to read your Twitter messages and how do you actually market yourself, products or services? It is really is quite simple. It all comes down to getting twitter followers. Twitter Followers: Twitter followers are people who sign up to get all of your messages as you send them. So the trick is to simply draw people to you and get them to sign up for your updates. There are a variety of ways to get individuals interested in what you have to say. Your main goal will be to find people who are willing to link to your profile and from there they will sign up to follow you. Let’s take a look at some different tips that you can use to get people to link to your profile and follow you on Twitter. Include a link to your Twitter profile in your email signature. This is a great way to get your information out. If you are on other social networks or have a blog, use this as a means for advertising your Twitter profile. Make sure you provide information and a link to your Twitter page. Let people know you are on Twitter. Give out your information as much as possible. Talk about it at meetings, luncheons and any other associations you have with other people. Add your Twitter information to your business cards and any other documents that you distribute. Purchase a banner and advertise your Twitter profile on it. Twitter Marketing: As you are driving people to your Twitter profile, keep in mind that in order for them to sign up for and to continue to read your tweets you will want to be providing them with quality content that spikes their interest. Depending on what kind of product, service or social medium you are looking to promote, there are some great ways to get the word out. Let’s take a look at different information that you can include in your tweets for marketing purposes. Keep in mind that depending on what you are selling or promoting, some of these may not work for you. Tweet to your follower’s about upcoming sales and promotions. Tweet to your follower’s information on new products and services you are providing. Provide links to your web site for such things as updated news stories, sales, promotions, customer support and anything else you deem will attract their attention. For conferences and events you can tweet live updates and last minute changes and opportunities. Provide quick product descriptions and customer reviews. Overall, it is clear to see that Twitter, when used wisely, can be a very critical social medium tool in marketing your products and services. Along with all of the above tips, it may also be useful to find the top Twitters and follow what they do. They are always looking for new ways to attract followers and to market themselves. If you follow their lead, you just may pick up some additional ideas. Here are two tools which have become popular. Each one is suited to different operations and that’s why I’ve included them both. The first is a maketers dream because of its set and forget style of operation. 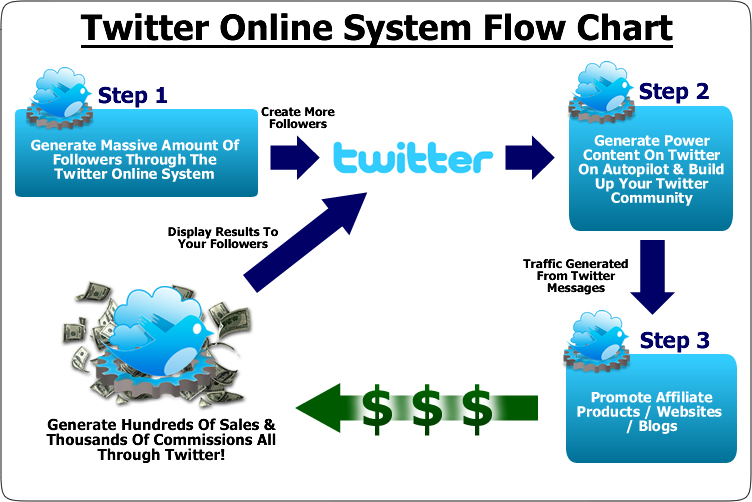 It’s a system that allows you to create a lock-up style of marketing business via Twitter and is highly effective in finding targeted followers for that purpose. When I tried this set-up, I was impressed. Check this follower system. The second piece of finding followers software is more for control type people (like me). I like to ensure I’m not overdoing it and I like it easy. Plus every month (approx.) they release a new tool. They don’t have a sleek marketing message but this software was also equally impressive and worth a visit. See what they have to say about themselves here.